Is spelling really that hard? @Fackinloaded, I thought it was talking makeup. @Fackinloaded, almost every time I see a DnD meme, rogue is spelled wrong. I don't get it. @Fackinloaded, honestly, it really depends on the day. Today I can spell trinitrotoluene, but tomorrow I may struggle to spell TNT. I relate to the Paladin, as I also get confused when a talking anthropomorphic bat and/or type of red makeup steals from random people. @Melon Dragon, Rouge is a rogue. @Melon Dragon, I am aware of this, and this fact wouldn't make it any less confusing to be stolen from by an anthropomorphic bat when we live in a world where they do not exist. As seen in the recent movie, Star Wars: Rouge One. You know, that one where Nicole Kidman plays a Stormtrooper who falls in love with Ewan McGregor's Obi Wan Kenobi, who's struggling to write the Jedi texts in musical theater form. 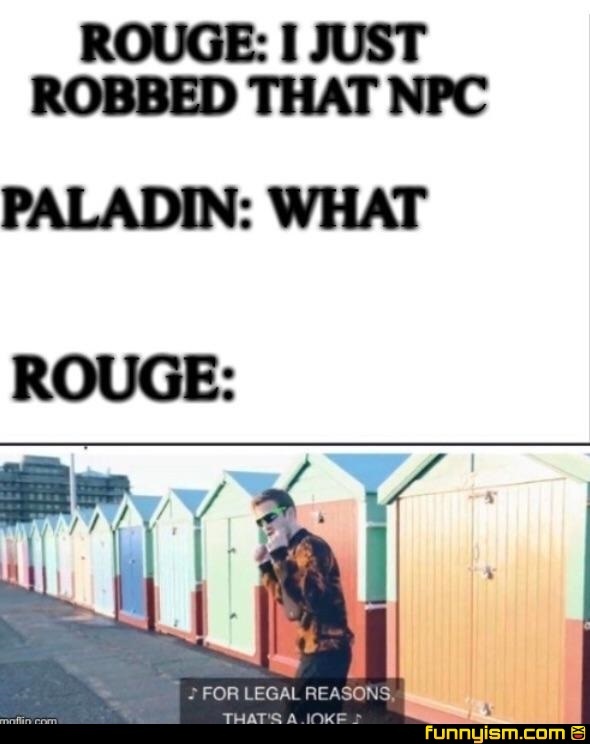 We have two thieving characters in my group and I am a very righteous paladin but my passive perception is 9 and so I never catch it happen. Anybody keeping up with the whole t-series thing?